Cyber Monday update: almost everything in this post is an EXTRA 20% off for Cyber Monday — we’ve also done a roundup of shoes and bags in the sale! I’ve been a busy bee going through the early Nordstrom Thanksgiving sale all day! 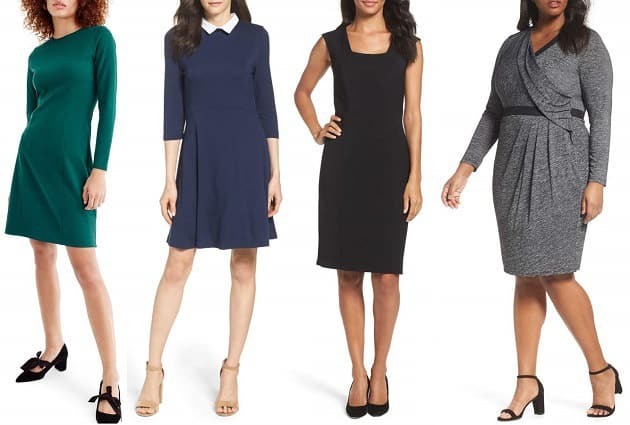 Note that they’ve kind of got two sales going on right now: one is the big designer clearance sale they always have around this time of year, and the second is early markdowns hitting the racks in anticipation of their usual Thanksgiving sale — with TONS of workwear under $100. 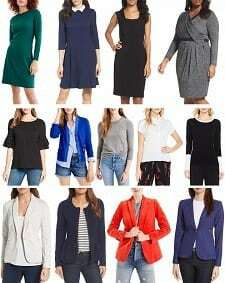 On the designer side of things, I’m noticing a lot of sale items for Manolo Blahnik, Chloé, Max Mara, Akris punto, Prada and more — and on the regular side of things, lots of good deals on J.Crew, Lafayette 148 New York, Kate Spade New York, Nic + Zoe, AGL, Stuart Weitzman, and Tahari. Note that there are also lots of good deals on beauty, including on Urban Decay (some up to 50% off! 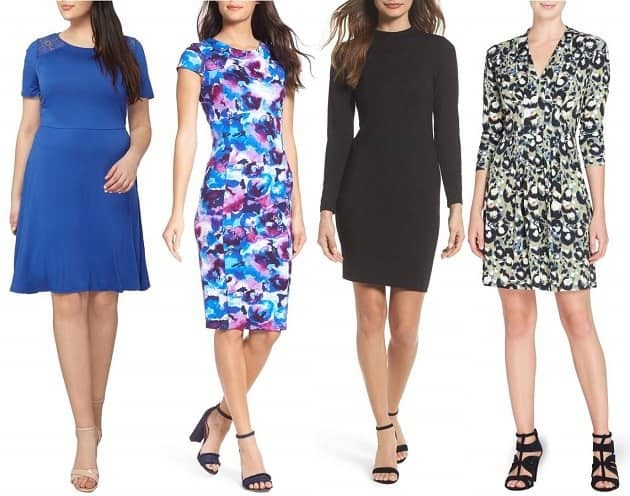 ), MAC, Philosophy, and Bobbi Brown — and of course some great deals on lingerie including Natori, Chantelle, Hanky Panky, Yummie Tummie, and more. I’ll have to save the shoes and accessories in the Nordstrom Thanksgiving sale for another post — stay tuned! 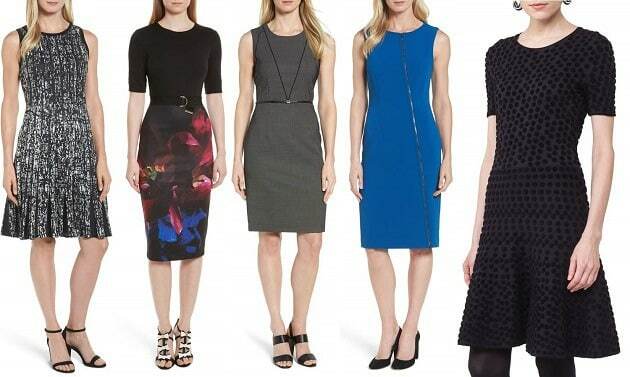 Dresses for Work in the Nordstrom Thanksgiving Sale — Under $100! 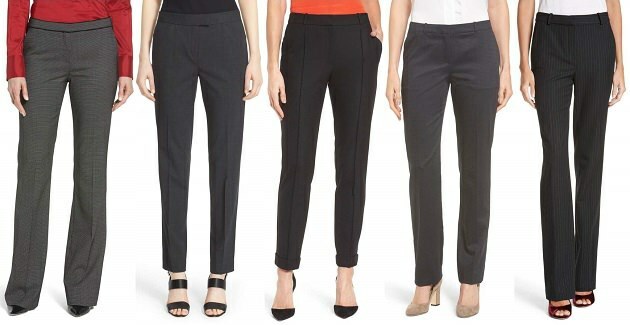 I seem to have missed an image for these $75 stretch knit trousers — the brand is a reader favorite with lots of styles on sale! Sigh, okay. I’m going to vent about something that I don’t think should be bothering me as much as it is. Yesterday was my 30th birthday. It comes about two weeks after my fiance’s birthday (also 30). I always go out of my way to make his birthday special — especially this one because it’s a big milestone. My love language is gifts, so I get that that comes more naturally to me than to everyone. I planned a really fun weekend for the two of us with lots of his favorite activities, a fun outdoor adventure, drinks with friends, baked a cake and made him a nice dinner, and then got him a nice ($500) watch. He had asked what I wanted and I said “a tennis bracelet – doesn’t have to be real diamonds just something nice and boxed with a nice card.” On Tuesday, I asked what he wanted to do and he said “you can do whatever you want.” Obviously, that is true, so I told him I’d like to go to dinner at a nice place. Yesterday, (my birthday and obviously a weekday) he had to work, so I puttered around the house, read a good book, and cleaned. He was meant to get home at 6 and after bugging him about it, he made reservations for 730. At 6:15, I texted him to ask when he would be home. Keep in mind I’d been just hanging out alone for my birthday the whole day. He said “I decided to take my computer to get fixed, so I’ll be home at 7:15.” At around 7:30, he got home, we rushed to dinner (which was at a fine/okay place but not a fancy place by any means). We had a nice dinner but I was a bit bummed and trying to get over it. We get home and he’s like “Okay I have to wrap your gift so hang out in the bedroom.” I do that and he comes in with a huge box. I open it and it’s a fake Christmas tree and he’s like “happy birthday! I thought we could decorate for the holidays.” I was like okay, cool? We set it up and it’s fine, he picked it up at Home Depot and it seems nice enough. Here’s the thing — the rational part of my mind is grateful that he got me a present and took me to dinner. Those are both lovely things to do. I want to feel happy and excited and grateful about it but I just feel.. sad. I think just coming off of a couple of weeks ago, when I really went overboard trying to make his birthday special and show him how much he means to me, he just made me feel like… an afterthought. I think I wanted something where he would get me a gift for me, that really made me feel special, and plan stuff that showed me how much he loved me. Instead, he got a gift for our house, not really for me, and he didn’t get a card or plan anything without prodding. I know that’s probably an unfair standard because he did do some planning and wrap up a gift, but it feels so stark in comparison to what I did for him that it’s really bumming me out. I don’t think there’s a solution to this. I just wanted to vent for a bit. It is totally okay for this to bother you. The fact that you are aware of the distinctions in love languages is also good–presumably your fiance expresses his love in other ways that are satisfying and fulfilling to you (otherwise he wouldn’t be your fiance). Gently, I would encourage you to express to him that you’d like him to make a slightly bigger deal about your birthday . . . and then make yourself stop prodding. He has no reason to take initiative if you are always checking in, and if you continue that pattern, you’ll always feel like you helped plan your own celebration. And buy yourself a tennis bracelet! Oh man. I would be P!SSED if I were you. He decided to get his computer fixed?! He got you a fake tree?! You need to be honest with him and tell him that you don’t feel appreciated or valued. You have every right to be mad. Have you done any pre-marital counseling on communication? It would one thing if he asked you what you wanted and you just said ‘I don’t know’. But you provided specific information and he didn’t seem to care at all. It’s not like he went to buy you a tennis bracelet and then saw a lovely necklace that he thought you would love instead. He bought you something that’s basically a necessary item for Christmas which is totally unrelated to your milestone birthday. Ugh I feel you. My husband won’t do anything for my birthday unless I spell it out exactly and even then there’s usually not a lot of effort behind it. My solution has been to basically always plan our big annual vacation over my birthday – I love traveling and we usually travel in style so I always have a pretty nice birthday that way and somehow coordinating everything doesn’t bother me nearly as much when we are traveling vs if we’re just at home and I have to make my own birthday plans. It might not work because of the timing of Thanksgiving, but it’s something to consider if you like traveling. Your 30th Birthday? I think you need to have a serious conversation. Why did he think it was okay to ignore your request? Why didn’t he want to be spending more time with you? Did he appreciate what you did for him? +1. There’s a difference between not rocking the gifts (many people) and totally not doing what you asked and then on top of it running an errand for himself. I’d be concerned about the latter. Why is it so important he make a big deal out of your birthday? Are you perhaps upset because he generally ignores what you want, and not about this one instance? Super late to the party here. I keep going back to your opening paragraph – that you don’t think this should be bothering you. Why do you have such little regard for yourself that you think your fiance’s behavior is anything approaching acceptable? He has zero respect for you. He made you late for dinner because he wanted to run an errand that he easily could’ve put off til the next day? When he was already running late because of work? That’s not acceptable from a first date. It’s certainly not acceptable from a fiance, and totally unacceptable on a special occasion. Is he always this disrespectful of your time? As if that wasn’t bad enough, he not only didn’t get you a birthday gift but then he gaslighted you about it. He knew he was supposed to get you a gift, knew what he was supposed to get you, then failed to do it. Instead of fessing up and apologizing, he decided that you obvi have the intelligence of a toddler and will be happy with just anything he deigned to repackage as a “gift.” So he got a tree – that he’d already gotten/been planning to get for the holidays – and wrapped it as your “gift.” Now he doesn’t have to spend money on you! Or put any actual thought into something that’s just for you! Score for him! You are not a priority to him. He does not respect you or your time or your emotional needs. If this is how he acts on a special occasion I shudder to think how he must treat you on a daily basis. DTMFA. – I’ve lessened up what I do for him a bit and tried putting myself in his shoes. I truly love giving people creative gifts and planning events, etc. but I also realized that just because I like doing that, does not mean that he likes doing that. BUT the fact that he doesn’t like doing that also doesn’t mean that he doesn’t love me or care about me. Honestly, I think half the time I went all out for his birthday or our anniversary or something was half as much for me as for him, since I found it super fun to plan all of those things. He was always very thankful for them, but it did not inspire him to recreate on his own, because that is just not who he is and that is not fun for him – it is stressful. This is has helped me not lower my expectations, but change them. – As I’ve gotten to know his family better over the 10+ years we’ve been together I understand where it comes from. I’m not saying that this makes it ok, but his family is TERRIBLE at remembering birthdays, anniversaries, and other special events, whereas in my family my parents made a huge deal of our birthdays when we were kids and still do to this day even though I don’t live at home. Understanding this has helped me appreciate the efforts that he’s made because he just was never taught to act like that. And really helped me in realizing that just because birthdays/occasions are important to me does not mean that they have to be equally important to him. However, he needs to know how I feel and respect that. My husband is also terrible at birthdays and most of our major fights have happened on my birthday, so I feel you. He is an otherwise great spouse so I have lowered my expectations somewhat – and he has gotten slightly better with time. They just didn’t really do birthdays when he was growing up, I guess. But your 30th? That’s a special birthday and I understand why it hurts. I think you need to have a real conversation about how hurtful this was for you and how he could make it up to you. Could he throw a huge thing for you next month on the day of your birthday? Start things off with a baguette or crackers and some cheese, maybe some nice salami, maybe some grapes and those rosemary marcona almonds from Trader Joe’s. For dinner, the easiest thing would be to make some salmon. Buy some pre-marinated salmon filets (or just regular is fine too). Use the directions here — https://www.thekitchn.com/how-to-cook-perfect-salmon-fillets-230150. It takes about 10 minutes total. Then make a salad with arugula and chopped tomatoes, cucumber, red pepper, olive, and feta. Toss with a light drizzle of balsamic vinaigrette. I always recommend chicken Marbella from the old Silver palate cookbook. Not much more to it than throwing stuff into a baking pan and sticking it in the oven, and everyone loves it. I’d do this with a baguette or two, a nice green salad and an assortment of cookies from a bakery because everyone loves those. Except don’t follow that nonsense about cutting up your own chicken. Just buy skin-on bone-in chicken parts already cut up. I like dark meat like thighs but a lot of people just like breasts so I’d probably just get a bunch of skin-on bone-in breasts. Main course- I’d do a pasta of some sort. People are still in a turkey funk, so a ‘meat & 3’ type dinner menu is going to be a bit much. Boil water and cook pasta. You can do this while you make the sauce. I’d make a quick sauce of veggies (heat olive oil, onion till soft, add garlic, then add veggies- I usually use some combo of spinach, asparagus, zucchini, yellow squash, small tomatoes, broccoli cut small- just about anything lurking in my fridge. Once nearly cooked, add some chicken stock & dry white wine. Cook down some more. Add a good handful of grated parmesan and the cooked pasta. If too thick, add a little of the pasta-cooking water. Salt & pepper to taste. Pass additional parmesan at the table. Dessert- Strawberries left over from making the salad, with sweetened whipped cream.